Kate Jacobs’s debut novel, THE FRIDAY NIGHT KNITTING CLUB, was a word-of-mouth bestseller, catching on not only among avid knitters but also among fans of women’s literature in general. It’s now even set to become a feature film starring Julia Roberts, which will release sometime in 2009. 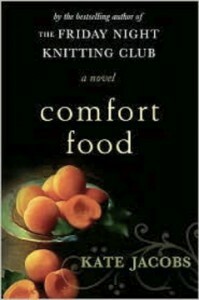 With her second novel, COMFORT FOOD, Jacobs again delves into the lives and loves of a group of interconnected friends and family. This time, however, the ending is decidedly less weepy and more, well, comforting. Augusta (Gus) Simpson is a familiar face to millions of Americans. She’s the star of the longest-running series on the Cooking Channel, “Cooking with Gusto,” and her face adorns not only countless television sets but also her own line of cookware and other household products. But as Gus’s fabulous lifestyle (her TV show is filmed out of the spacious kitchen in her Westchester manor home) marches on, so does time — and Gus is staring 50 squarely in the face. Is it possible that this energetic, hot mama has left her youth behind her? It seems that Gus’s bosses at the Cooking Channel are asking themselves the same questions. With a roster of new, hip television chefs and a handful of new extreme theme programs designed to appeal to ever-younger viewers, perhaps Gus’s show seems a little, well, old. Can Gus and her friends at the network figure out a new format that will preserve it from cancellation? For Gus, the answer to her problems is right under her nose — at her kitchen table, in fact. When an unexpected cancellation leaves Gus scrambling for show guests, she recruits her friends and family to serve as co-hosts and sous chefs, with humorous, and delicious, results. This accidental pairing of Gus’s closest friends and family — including her twenty-something daughters Sabrina and Aimee, Sabrina’s ex-boyfriend Troy, and Gus’s painfully reclusive neighbor Hannah — with aspiring Cooking Channel host (and former Miss Spain) Carmen Vega leads to a new hit show…and plenty of tension. As the guests come together at Gus’s table, tempers flare, tensions mount, and there’s plenty of time for everyone to discover not only delicious food but also new truths about themselves. At times, COMFORT FOOD can seem like a glimpse into a particularly fractious group therapy session, as sisters bicker with each other (and their mother), as former lovers try to become friends, as jealous co-workers negotiate professional boundaries, and as at least one woman tries to overcome her past mistakes. Jacobs successfully balances these somewhat tiresome exchanges, however, by offering numerous flashbacks into each character’s past, providing much-needed character development that can help gain readers’ sympathy for these sometimes prickly individuals. Gus herself is a winning character, and readers will be cheering for this mature, lively heroine to achieve both professional and personal success — which may even include love, an ingredient that’s been missing from Gus’s life since her husband’s death years before. Happy endings and a mid-life shot at romance will leave readers of COMFORT FOOD satisfied but looking forward to another helping of feel-good women’s fiction from Kate Jacobs. You are currently browsing the Yankee Wife blog archives for August, 2009.